Over four seasons, Vikings has created an a quasi-historical world with an impressive sense of growth. It’s hard to remember the days when Ragnar Lothbrok (Travis Fimmel) was a simple farmer with a vision of crossing the ocean for plunder now that he’s amassed a kingdom, alienating friends and family in the process. That includes his first wife, Lagertha (Katheryn Winnick), who has gone on to claim her own power as an Earl. 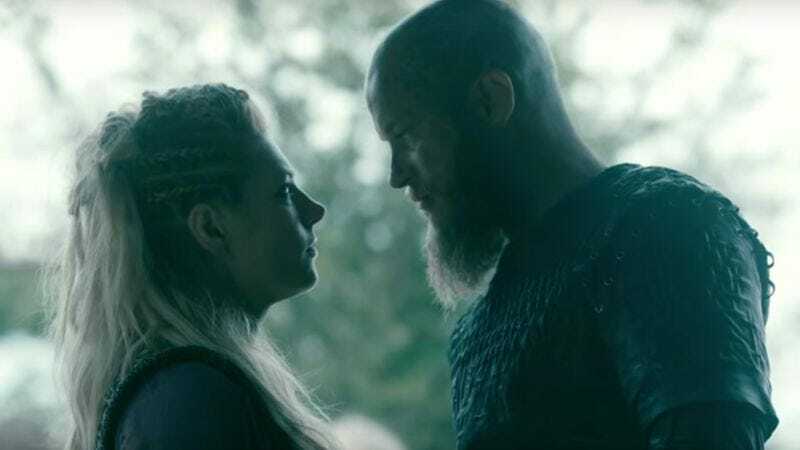 Her storylines are a highlight of the show, but Lagertha’s intersections with her ex are a bit of a bummer, as they remind us (and them) of the happy family life that Ragnar cast aside for a throne. Last episode reunited the pair during a raiding expedition on Paris—despite the fact Lagertha is pregnant. The king disapproves of such recklessness, but considering that Lagertha murdered her second and third husbands, her first husband might want to ease up on the mansplaining. In this exclusive clip, Ragnar again attempts to talk his ex-wife out of entering battle, while more pointedly expressing remorse over their estrangement. Lagertha explains to her king that it has been prophesied that she would never have another child, and therefore she has nothing to lose. As always, Fimmel and Winnick share great chemistry, as Lagertha shuts down Ragnar’s handsy attempts at affection. The next episode of Vikings, “The Profit And The Loss,” airs on History Channel tonight at 10 PM ET/PT.